Triamcinolone is often used to treat red and itchy skin caused by a number of conditions. It is a corticosteroid, which reduces swelling. Triamcinolone is also often used in conjunction with antimicrobial and antifungal drugs in the drugs Animax and Panolog to treat ear and skin disorders caused by allergies or infections. 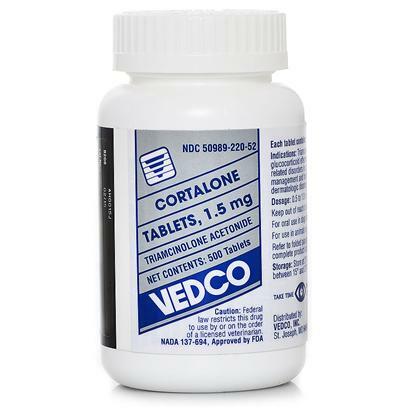 Side effects of triamcinolone acetonide may include vomiting, stomach upset, changes in appetite, edema, heperglycemia and impaired wound healing. Triamcinolone acetonide should not be used in the presence of systemic fungal infections. Use with caution in pregnant animals especially late term.